A unique motorcycle-inspired by steam train had been created by by Dutch company named Revatu Customs. 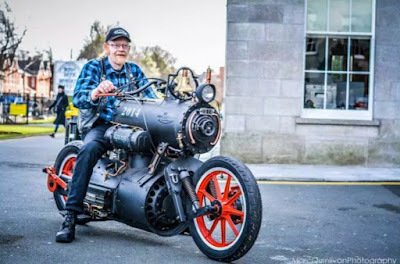 This two-wheeled locomotive is a fully functioning motorcycle, albeit a slow one has a frightening form, and has been exhibited in an automotive event in Rosmalen, Netherlands, named the Bigtwin Bike Show. 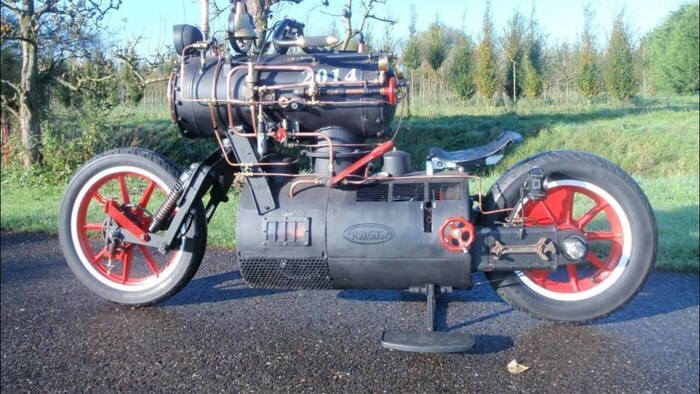 As reported by Ridingmode on Friday, February 12, 2016, motorcycle, named the 'Black Pearl' is different from the vehicle in general, because it is driven by steam. 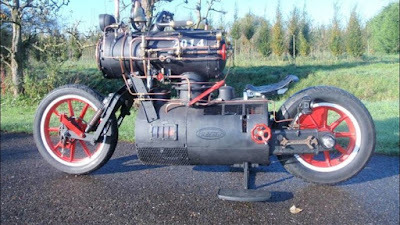 The motorcycle flaunts its fully functioning steam engine, with the rear wheel driven by a big crankshaft mechanism. Another unique thing found on the Black Pearl is a typical bells and steam horn embedded in the front side of the motorcycle. To provide comfort to the rider, this bike has two shock absorbers that connects the steering to the wheel through a trailing link structure, with a drum brake that is assigned with the task of stopping the vehicle.